The Sovrana Viaggi presents to you "Travel Back in Time"
The objective is in preparing different itineraries to introduce to our clients the history of "Old Europe" aboard antique trains combined together with accommodation in wonderful "Medieval Castles", some of which are private and others hotels, where the clients can take advantage of the many possibilities the castles offer for relaxation and sport. We suggest you take a journey across the beautiful countryside on the most exclusive trains in the world. 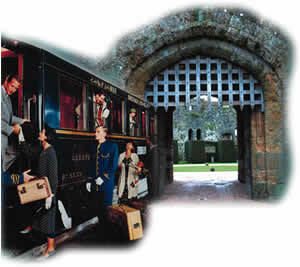 The most famous and romantic train in the world, offering various itineraries in Europe, here you are taken into an unforgettable journey back in time, combining the luxury and elegance of the Venice Simplon-Orient-Express with accommodation in splendid original medieval castles which are steeped in history. Moving from one castle to another with your own car or with a hired car, choosing one of the 10 day made to measure tours called “The Best Of”… Austria, France, Germany, England, Ireland, Italy, Portugal, Spain and Scotland; or the a seven day tour of the Loira Valley. This magnificent antique Edwardian style train offering exclusive estate cabins all with private facilities, will take you on an incredible journey though some of the most breathtaking scenery of Scotland with its beautiful glens, stunning lochs and miles of unspoilt coastline. Aboard this Imperial train where once the Emperor Francesco Giuseppe and his legendary wife the Empress Sissy travelled, today our guest while enjoying a stay in Vienna, will experience an unforgettable excursion, during which wine tasting and dinner will be provided. In the elegant and refined ambience of the Italian castles, nestled in the most natural environment, every detail is an invitation to find serenity and harmony, we propose from three to five days beauty treatments for a perfect “Remise en Forme”. A delightful seven day tour, an itinerary to follow… "On the Trail of Harry Potter", this incredible personality has fascinated not only thousands of children but also many adults. The first luxury-train hotel in Spain, from Santiago de Compostela to León, the traveler will discover all the magic of northern Spain, from the land of Castilla-León to the waters of the Cantabrian. Welcome aboard the exclusive Trans-Siberian Express train, (a real luxury hotel on wheels), the Trans-Siberian Railway traverses the whole expanse of Russia from Europe to the Orient, enjoy the elegance of train travel, here you can relax, sit back and enjoy all its modern comforts. Navigating on the magnificent Shannon river with one of Irelands most exclusive and luxurious castle line house boats, each one with the name of a famous castle, and offering the maximum of all comforts, combined together with a two night accommodation in a wonderful authentic Irish castle.